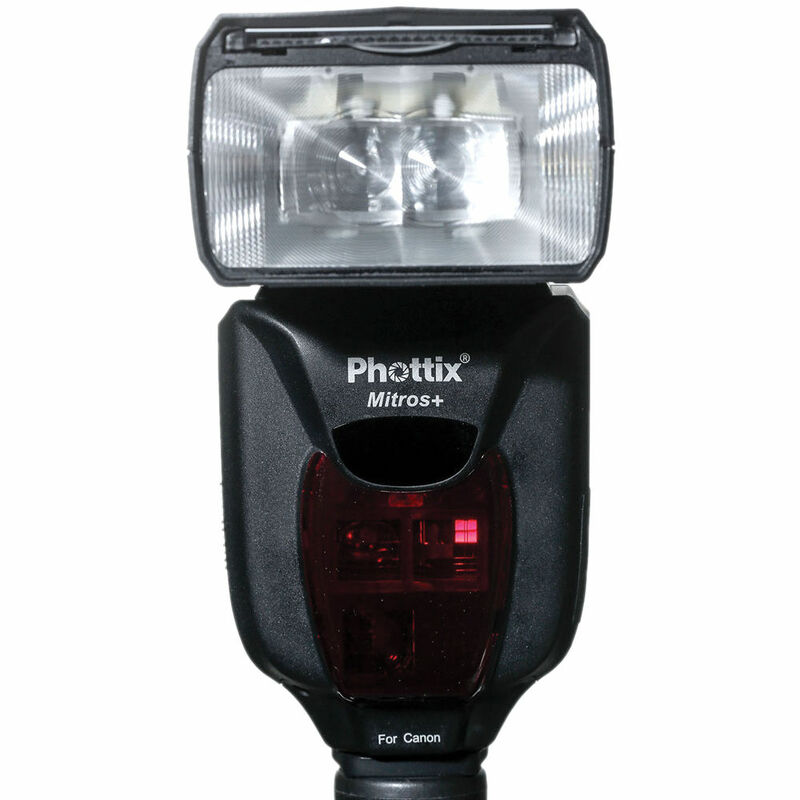 The Phottix Mitros+ TTL Transceiver Flash features a built-in Odin transmitter and receiver as well as full E-TTL / E-TTL II functionality for use with Canon cameras. The Mitros+ has a guide number of 190' at ISO 100 in the 105mm position, useful for illuminating subjects within a zoom range of 24 to 105mm. Additionally, the flash features wireless transmission via an optical pulse or IR triggering and can access 4 channels and 3 groups. Box Dimensions (LxWxH) 9.6 x 4.3 x 3.4"
Mitros+ TTL Transceiver Flash for Canon Cameras is rated 4.1 out of 5 by 18. Rated 5 out of 5 by Npompei from Great Flash! I have used all of Canon's flashes except for the new 600 and I have to say the Mitros+ is head and shoulders above the Canon's. The usability and versatility of these flashes are just awesome. As a wedding photographer it is so nice to be able to control the power of my external flashes from the back of my on camera flash. It's a feature you really can't pay enough for.The build quality is absolutely fantastic. The only real down side is they are heavier than the Canon's - which is good and bad. If you are an event/wedding/studio photog, these are a must have for a flash. Rated 5 out of 5 by Mr. L. from ExcellentFlash/TTL Radio Trigger I use this flash on a flash bracket for event photography where I'm having to move around. I set several other flashes (Canon 580ex & 580EX II on Odin radio triggers) around to fill the room with light and use one on the bracket as a fill light. Works perfectly. I also have the Phottix Odin Commander which I put in the hotshoe for a static shot (portrait) and then move the Mitros+ onto a light stand and set it to be a reciever (slave). Very versatile! I never see Phottix advertised in the photo mags but it appears to be the most advanced radio system around. Rated 5 out of 5 by K.Walton from Perfect! Ok we know what everybody wants to know, how does this compare to the 580exii?? Well in my experience it has performed just as good if not better. I'm not saying this flash is more powerful than the canon lite, but I will say it's just as powerful and I LOVE the menu layout!! It has a battery gauge and other features the canon doesn't provide. It can be used as an optical slave from ANY flash and doesn't require a separate adapter like the 580exii. If you run a phottix wireless remote system like I do, this flash has a built in receiver/transmitter which saves you from buying a separate receiver to work with other brands of flashes. If I need another speedlite it will most likely be another one these! Rated 4 out of 5 by Kenny Wu from Get one, but probably not 2. Well, I've had my Mitros+ for over a year and primarily use it in Manual mode with the Strato II RX. I rarely use TTL Odin TX or RX. Over the past year I really wanted to like this flash, but as some review suggested, I too have seen very inconsistent flashes when using the Strato II Trnasmitter with the built-in RX. I've asked numerous times for a fix via firmware and it took them years to come up with a fix. Also, Phottix have never made an upgrade that installed properly without lots of fumbling around. For those who are looking to remotely control you flashes in manual mode using the Odin, be aware that there is no way to get rid of the TTL pre-flash even in the Manual setting, so you might not have the additional flash power / recycling advantage even when using manual remotely (kinda the whole point of using manual). Also power settings using the Odin TX does not correlate to the bare manual slave mode. i.e. 1/8th power on ODIN is not 1/8th power when using bare manual. it's about 2/3- 1 stop brighter on the ODIN. If power/ recycling is what you need, get the Strato II TX system. Remember to perform the firmware upgrade tho, otherwise you will get very inconsistent flash power as I did. This problem is fixed in the V.2 firmware. BTW the latest firmware is actually a good upgrade, provided if you installed everything correctly took me a few tries. It works well with my Odin 1.5 after my rigorous testing with it. The power consistency issues when used with he Strato II transmitter has finally been fixed. Thank the gods I don't have to lug around a separate receiver for my Mitros+. Wasn't the whole point of getting a Miitros+ was so that all that stuff is built-in? Well, better late than never I guess. If you're on the fence about the Mitros+, I recommend getting one. But not two. I find the LP180R to be a much more consistent slave at 2/3 stop more powerful, and at a fraction of the price with the same Odin RX functions. You'd lose out on the channel IDs of the Odin II & the built-in Odin TX with the LP180R. (i.e. you have 4 public channels only.) 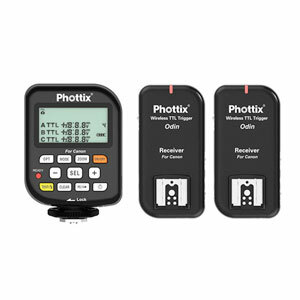 The Phottix system remains to be the best mix and match wireless system that work well with Studio strobes esp. Phottix Indra and Elinchrome systems. I recommend the Mitros+ it if you aspire to move into Studio strobes and mixing it with Speedlights. Rated 1 out of 5 by Digital Rev Guy from NOT RELIABLE!! The flash has completely failed several times in critical situations, none that would be related to overheating and finally died during a sunset shot that I didn't get and couldn't be re-shot. Great flash, if you don't care if it flashes!!! Rated 5 out of 5 by Michael Keeney from Just As Good As Canon's What can I say? I purchased three of these with the Odin trigger and they work flawlessly and just as well as Canon's. The flashes are very well made and come impressively packaged. The flash contains a very nice case as well. The output from the flash is powerful and I've experienced zero miss fires. Very impressed. Must buy. Rated 1 out of 5 by AdobeTX from Completely unreliabel I was REALLY hoping these would be awesome and in theory they are. They work great out of the box, but I have gone through THREE flashes now, and all 3 have died on me within 2 months. I'm done with them. (fyi, I have used their flash trigger system for years with great results). Will this flash trigger a Canon 480ex wirelessly or only flashes of the same brand? This flash can trigger Canon flashes optically with an infrared pulse. So if I'm reading this correctly this Mitros flash (while on camera) can control via radio the Lumopro 180R flash which has an Odin receiver built in? Hello Sean,Please do proper research before purchasing this item. While I received several positive reviews from personal friends in the industry, I must say that the system failed me during a pre-wedding event this past Thursday! Unfortunately, I did not have a backup speedlight system as I always carry 3-4 speedlights to every event however, all three failed and many images were ruined.I have contacted Phottix and will be personally taking all of my speedlights to their service center first thing tomorrow morning! You could use the Phottix Mitros+ TTL Flash for Canon Cameras on the Nikon Df, though you would need to set everything manually. For the Nikon Df, your best bet would be the model made for Nikon (B&amp;H # PHMTTFN). Does it have a 3.5mm jack to trigger it as the Odin receivers do? I know it defeats the purpose of a wireless/radio system, but for high speed stuff it's better to have the manual connection to the automatic trigger for more consistent timing. It does... And I have tried it with triggertrap.it works. Can it be triggered optically by a non-Phottix flash? That flash has two wireless options.It can work in radio with the Phottix Odin system and it also can work with the Canon infrared system.It does not have a regular optical slave option. I've read a lot of problems with mitro+ not working.....has anyone experience this problem? Asked by: jimmy (nghia) m.
My issue is with the recycle time. It has a progressively longer and longer recycle time. I will often use it with a Quantum SC Turbo battery pack and even then, it will often take more than 5 seconds to recycle, which is way too slow for weddings. I will say it did work with my Nikon SB800's which are great, but one by one are dying and not worth repairing again. I tried the Phottix Mitros but because of the times I decided to bite the bullet and go with Quantum Trio which have a $200 rebate this month. With the battery pack they will recycle within about 1 second and do not overheat. They say you can shoot all day long without overheating, but I've only done about 50 rapid shots. So far so good. Will this work on Canon 5D Mark IV? You need the one made for Canon. I own Nikon, and have used it on different models, all flawlessly.